This recipe worked wonders on a painful sunburn I caught a couple of years ago. Though I hope you won’t have to try it, my advice is that you create that recipe and keep the little bottle in the fridge. So it will be there for you this Summer. 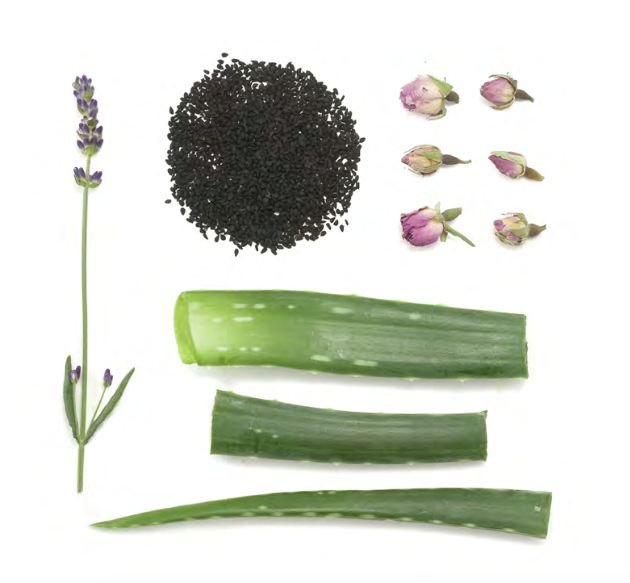 15 drops of lavender essential oil; lavandula angustifolia; heals and regenerates blemishes and sun damaged skin. Lavender has the most amazing healing qualities when it comes to burnt skin: Dr Gattefossé (considered one of the fathers of aromatherapy) made that discovery after having severely burnt his arm in his laboratory and put his arm in the first cold « liquid » available to alleviate the pain. It was lavender essential oil. The pain almost disappeared straight away and the wound healed so quickly and without scar.That led him that he study the amazing properties of this oil scientifically. Delicately clean the sunburned area with cool water and an oily natural soap. Dry very softly with a cotton pad. Mix all ingredients in a jar and apply with your fingertips until it penetrates. You can repeat every hour. You’ll see, the texture will feel a bit « weird » because the oil and the gel won’t mix properly. Note: if you don’t find nigella or rose hip seed oil, you can always create your mixture with 40 ml of sweet almond oil instead.